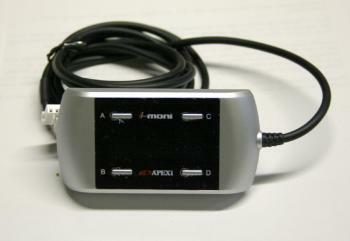 APEXi Electronics - i-Moni UNIVERSAL - Dezod Motorsports Inc - Home of the automotive performance enthusiast since 2002. The i-Moni (i-Monitor) is a simple plug-and-play monitoring device which instantly installs using any factory ISO 14230 OBD II diagnostic port. The i-Moni offers real time data display of up to four different parameters including: Engine RPM, Water Temperature, Intake Air Temperature, and Vehicle Speed. Since the i-Moni utilizes information drawn from the stock sensors, there is no need for costly and time consuming aftermarket sensors. Simply plug in the i-Moni to any ISO 14230 OBD II port and instantly receive streaming data on your vehicles vital information.